Inclusion: Combine search criteria, e.g. Profile type: direct consumers plus States: New Jersey will yield Direct Consumers in New Jersey. Existing profile groups can be combined as well to form new profile groups e.g. Profile group: direct consumers in the NYC zip codes plus the profile group described above, yielding a new Profile group: all direct consumers in New Jersey and the NYC area. Newly-created profile groups are then available for future use. Exclusion: Exclude search criteria and/or profile groups, e.g. using the Profile group: all direct consumers in New Jersey and the NYC area minus Profile type: direct consumers with reservations departing in the current year yields a new Profile group: all direct consumers in New Jersey and the NYC area except those who have reservations departing in the current year. TravelHerd prevents “blank searches” when creating profile groups by not displaying search criteria which do not yet exist; i.e. if no sales territories have been assigned, Sales Territories will not be listed as an available search criteria. Profile groups can be used to send targeted email campaigns from within TravelHerd using the email marketing module. The TravelHerd email marketing module tracks marketing emails opened and all click thrus on links in those emails. All email addresses which receive hard bounces (email address not found) are automatically marked as undeliverable and will be excluded from future campaigns. For all email addresses which receive soft bounces (recipient’s mailbox full or email server temporarily unavailable), TravelHerd will make six more attempts to delivery the sent email, to maximize delivery. All marketing email sent via TravelHerd’s email marketing module include a preformatted opt-out link. Using this opt-out link instantly opts-out the recipient’s email address to from all future marketing email campaigns; this is done to comply with the Can-Spam Act. A profile with opted-out or hard bounce status email address can revise their email address status through a double opt-in process. TravelHerd’s email marketing module include the option to create an email preview group. Email preview group members can be selected from the internal list of TravelHerd users at your company; group members can be deleted from the preview group and new members added at any time. 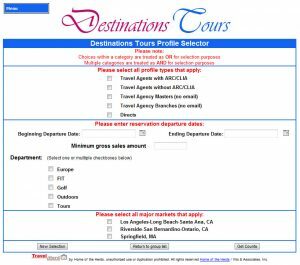 TravelHerd users have to opton to queue email marketing campaigns to the email preview group for internal review and revision. Email campaigns are saved so they can be queued to selected profile groups as required. Once queued-out, email history details open and click-thru counts. Profile groups can be used to create postal mailing lists as well in TravelHerd. Lists can be output in various formats including labels or MS Excel for either in-house or mailing house fulfillment. All profiles in TravelHerd can be opted-out of postal mail. 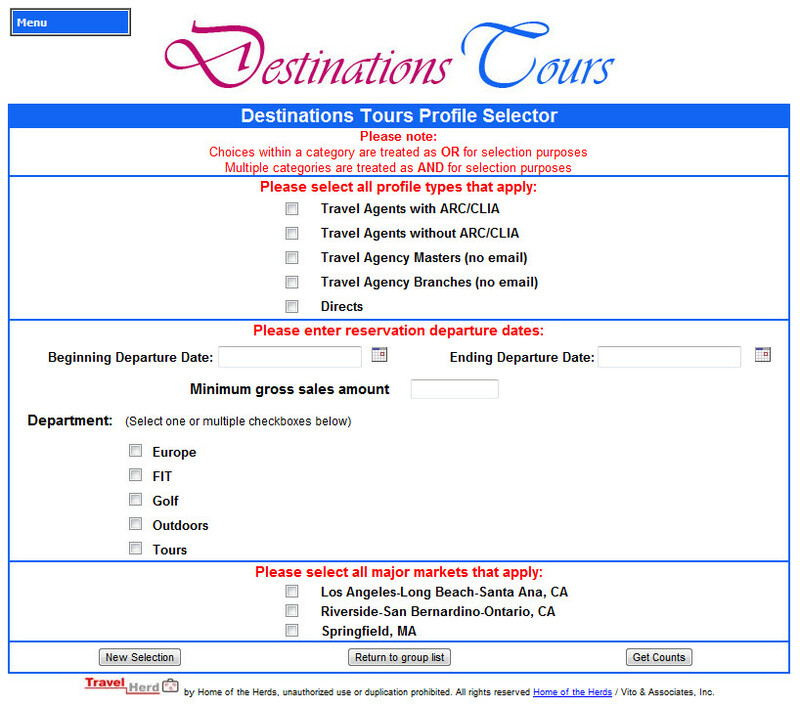 TravelHerd’s list segmentation options are easy to use and will greatly assisted your company’s marketing efforts.